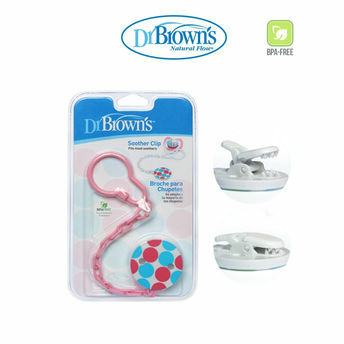 Dr. Brown's Kid's Pacifier Chain Baby Soother Clip is a durable universal pacifier clip set that will perfectly secure pacifiers close to your baby to keep it clean, germ-free and ready to use. This soother is to be clipped over clothing and tightened with a plastic slider. You can either keep it in your bag or hang on your stroller. These clips come in assorted colors, so that you can have your pick!